(Newser) – Four off-duty police officers providing security at a WNBA game in Minnesota walked off the job Saturday after players spoke out about police brutality. 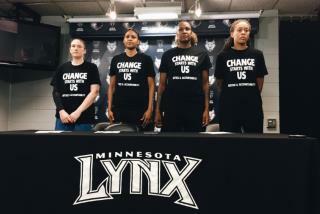 Several members of the Minnesota Lynx denounced racial profiling as well as the "senseless ambush" of Dallas police during a press conference ahead of a game against the Dallas Wings. Afterward, the team appeared for a warm-up wearing black shirts featuring the names of Philando Castile and Alton Sterling, a Dallas Police Department logo, "Black Lives Matter," and the message, "Change starts with us, justice and accountability." President of the Minneapolis Police Federation, Bob Kroll, later praised the Minneapolis officers for leaving their posts, per the Minneapolis Star Tribune. If you want to be a cop, be a cop. If you want to be a racist, be a racist. But, don't try to combine the two. Will blacks EVER stop being perennial victims? Time to fix your mess! Yep, change will come from women's volleyball. Definitely not from changing urban black attitudes about white people, especially police. Not from mandatory police body cams for all. Just women's volleyball. So simple!